At Orkin, we’re proud of the work we’ve done in the health care industry with leaders like the Association for the Healthcare Environment (AHE) and Practice Greenhealth and appreciate the opportunity to share the same expertise with you. Get customized tips that will help improve your pest management program in just a few clicks. When you’re finished, you can request your free copy (a $45 value) of the AHE Recommended Practice: Integrated Pest Management, a valuable training resource for you and your staff. Where do you spend most of your pest management time and resources? Whether you run a full-service or specialty hospital, assisted living facility, surgical facility, psychiatric center or substance abuse center, your care is focused on patients. But poor pest control can compromise that care in a number of ways. Pests are particularly worrisome for the highly regulated healthcare environment, where patients with weakened immune systems are receiving care. Cockroach droppings and cast off skins can aggravate allergies and even cause asthma attacks. Flies carry millions of microorganisms, making them a potent disease vector. Rats and mice are known to spread more than 35 diseases like Hantavirus worldwide, as well as bacteria including salmonella and even E. coli, according to the Centers for Disease Control and Prevention (CDC). Even bed bugs can hitch a ride into healthcare facilities and spread quickly, closing down rooms and driving down patient satisfaction. Between the dangers pests pose to your patients and the damage they can do to your reputation, your healthcare facility should have zero tolerance for any pest. A pest management partner can assess the pest risks in your facility, implement a custom plan to help manage pests and monitor for any problems that arise. With all this in mind, it's important to find the right, licensed pest control professional who will partner with you to implement all of these tactics to help keep pest problems away. 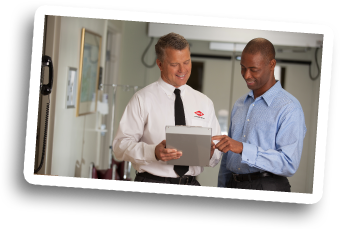 At Orkin, we're proud of the IPM training resources we've created with leaders like the Association for the Healthcare Environment (AHE), and appreciate the opportunity to share the expertise with you. For further education, submit a request for staff training. Orkin recently partnered with AHE to produce a white paper to address the growing problem of bed bugs in facilities across the nation. Find out the latest news about research, prevention and remediation when bed bugs bite. View the white paper (PDF). © 2013 ORKIN, Inc. All Rights Reserved.